Lovelies! We have missed you so! Did you have a wonderful weekend? Hopefully. Today class, we are going to be obsessing over major seating in the dining room. Major. Let the seats do the talking and the walking. How 'bout it? Zhushing up the seating in your dining room is the quickest way to update the look and also set your space above all of the others. Whether it be colorful, adorned or just flashy, it is all in the details. 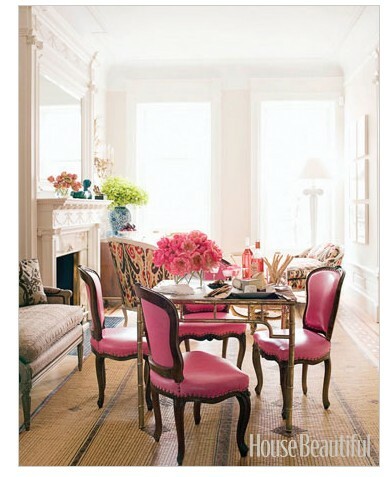 Love the shocking hot pink, nailhead, french inspired chairs. A man clearly lives here. Clearly.. The hot pink chairs add so much interest into the dining/sitting room. 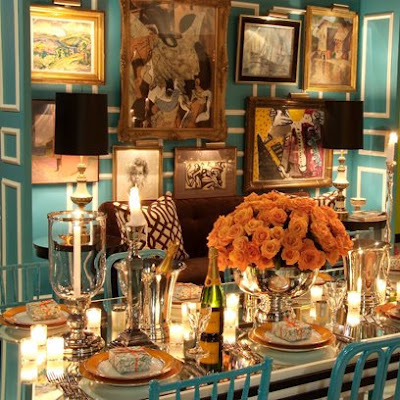 A fabulously eclectic space. The yellow upholstered dining room chairs are a very unexpected choice, while a very respected choice. Their shape adds a very classic feel to a harmonious chaos. Ahhhhh! Adore. Absolutely adore this room. 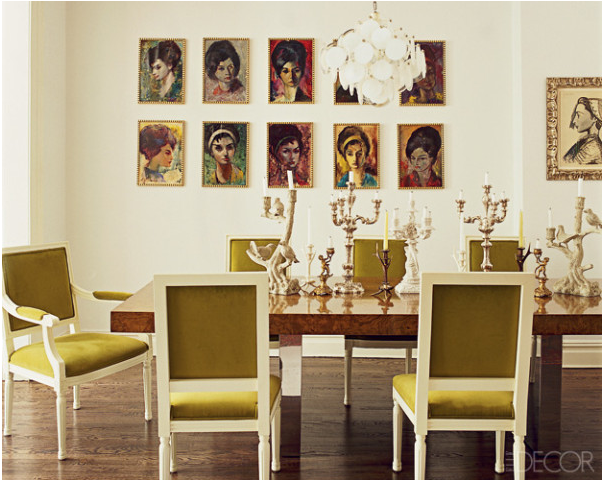 These kelly green dining room chairs are the absolute most. We are not sure if they are upholstered in a satin fabric or a leather, but either way, we truly don't care. What is not to love about this room? Oh and again, the chairs steal the show. Duh. Oh Johnny! He always gets us going. 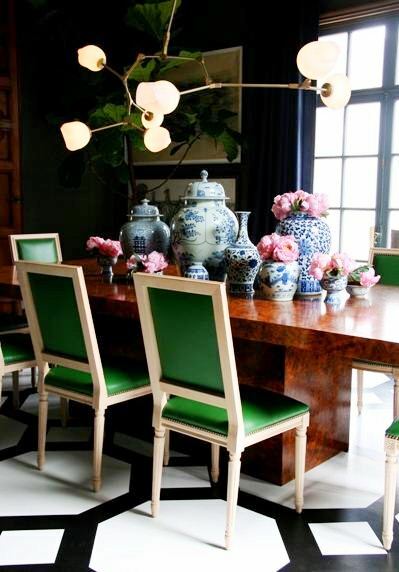 Who isn't obsessed with these lime fretwork masterpieces that we are feasting our eyes on? This whole room is fab, but the eye is immediately drawn to the neon seating. Let's get real. Again, such a fabulous space here. However, LOVING, the turquoise bamboo seating. This dining room is divine. I do not care that is over the top. I would adore stuffing my face here day in and day out. Ummmm. Ok. Let's get the defibrillator out here, folks. Two toned, tufted, nailhead, wingback seating? Get. Out. I believe my heart just skipped a beat. If this isn't to die for seating, we don't know what is. A fabulously moody, contemporary space. Another example of the seating stealing the show. We are loving the mix and match seating, of course. The coral wingback is so lovely. We would enjoy making that an everyday chair. You think that would fly in the office? So what if it didn't? I need it. 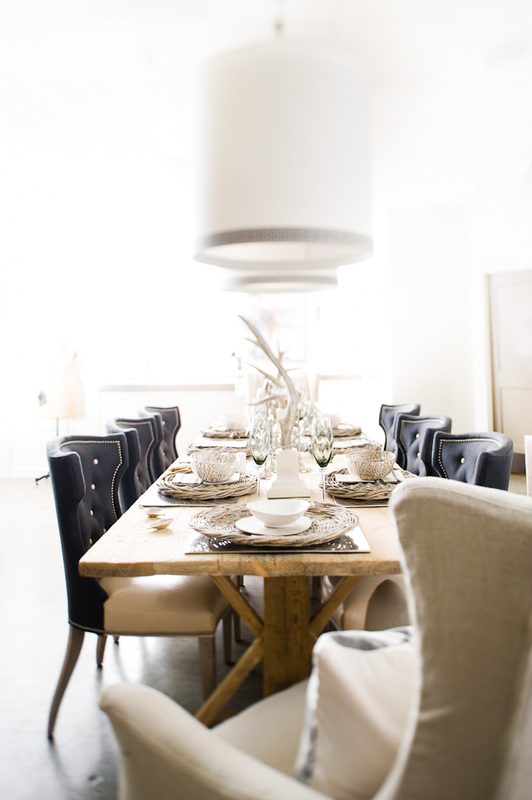 What a light, airy, traditional yet eclectic dining room. 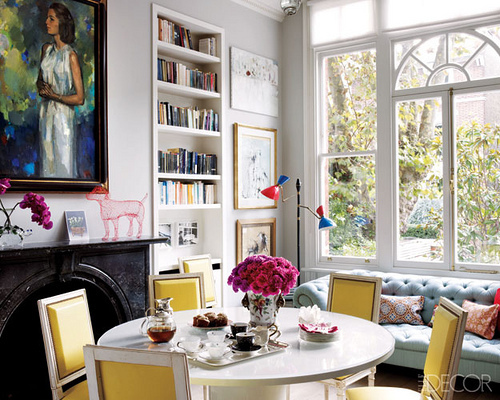 We love the boldness of the chartreuse seating. It adds the perfect amount of pop that this room would otherwise be lacking. As you can tell, we have chartreuse on the brain. Again, the chairs are the main focal point here. They are complimentary to the room but are just absolutely to die for. Who is loving the portrait gallery wall seen here? Us too! All I can say is that woman loved an updo and a headband. all of those chairs are gorgeous. I mean color-wise and bones-wise. I would die to have a set of something so beautiful - and six of them! One day, one day. This inspiration is lovely. i have an awful white dining room in my rental apartment in colorado that is just....sad. Where do I begin? love all these chairs (and dining rooms). Those hot pink chairs are my favorite! 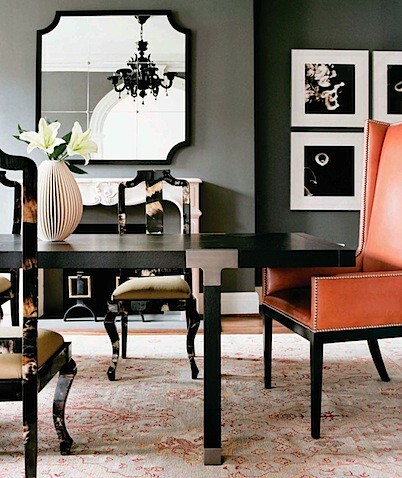 I love the coral chair with the gray walls. What is the name of the gray pain color?